Until recently, it was believed that Intelligence is a single entity. People are born with certain amount of intelligence. It is difficult to alter the amount of intelligence. It was believed that Psychologists can determine IQ by administering IQ test or simpler kinds of instruments like Alfred Binet and Testing. Then came the idea of Emotional Intelligence (EQ) put forth in the work of many scientists in 1900's. Daniel Goleman popularized the idea of emotional intelligence in his 1995 book on "Emotional Intelligence." According to Goleman, Emotional Intelligence is "the ability to identify, assess, and control the emotions of oneself, of others and of groups." The four major areas under emotional intelligences are- 1) Self-Awareness 2) Self Management 3) Social Awareness 4) Social Skills. Dr. Howard Gardner, a Cognitive Scientist at Harvard University conducted research between 1970 to1980 and he put forth the theory of multiple intelligences. After the research, he came up with his publication called "Frames of Mind – The theory of multiple intelligences" in 1983, which started popularizing the idea of multiple intelligences. According to Gardner- "An intelligence is a psycho-biological potential to process information that can be activated in a cultural setting to solve problems or create products that are of value in a culture." This potential is capable of being realized to a greater or lesser extent as a consequence of the experiential, cultural and motivational factors that affect a person. 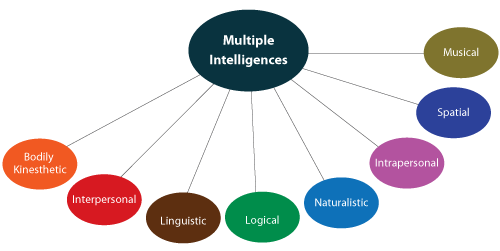 Howard Gardner has identified eight intelligences, which all of us possess in varying degrees. Emotional intelligence just caters to two of the intelligences put forth by Gardner- Interpersonal and Intrapersonal. All of us possess all of the eight intelligences in varying degrees. Some of us are naturally stronger in particular intelligences and weaker in other. However, with experience and training we can develop our weaker areas. Any profession needs the use of more than one intelligence. Example- To become a good scientist, one requires a high level of Logical-Mathematical, Naturalistic, Intrapersonal and Linguistic intelligences. Even Interpersonal, Bodily-kinesthetic, Spatial and Musical intelligences are required at different times in a scientist's work. Hence, we need to focus on helping children to discover their own intelligence profiles, and develop in each of the eight intelligences. 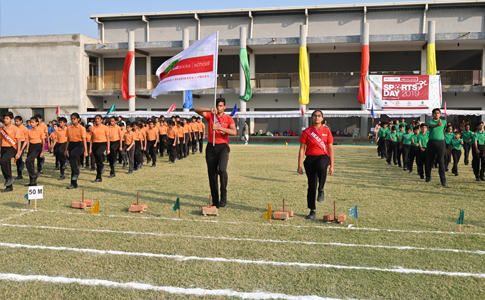 Ultimately, they can also choose professions according to their area of strength and interest. Schools around the world have now started looking at children and the curriculum through the lens of Multiple Intelligences. They have found that it can benefit a wide range of students, from slow learners to gifted, by applying the eight areas of intelligence to the classroom. Thus, it has spread far and wide now. MI fits with the existing philosophy of most educators that all children can learn & we need to focus on their wholesome development. MI validates what teachers already know – All students do not learn the same way and we need to evolve practices to fit different learning approaches of students. MI provides vocabulary and common understanding for many terms to educators. MI helps teachers to extend their practice with the help of colleagues by 'thinking' together. Wide variety of teaching and assessment methods- materials that are worth knowing are presented in ways that afford each child the maximum opportunity to master those materials and to show others (and themselves) what they have learned and understood.